I was just about to go to bed but had the MLB Channel on when I began to pay attention as Harold Reynolds began to say in the top of the 5th inning of the Giants-Astros game “to Call your friends because history is being made by Matt Cain.” On a night were Met’s pitcher R A Dickey pitched a one-hitter and in a season that had already seen 4 no-hitters including a Perfect Game by Phil Humber, this was more than amazing. The first Cain was not known for his pitching skills and ended up with a mark that remained with him the rest of his life, not mark any of us would want. 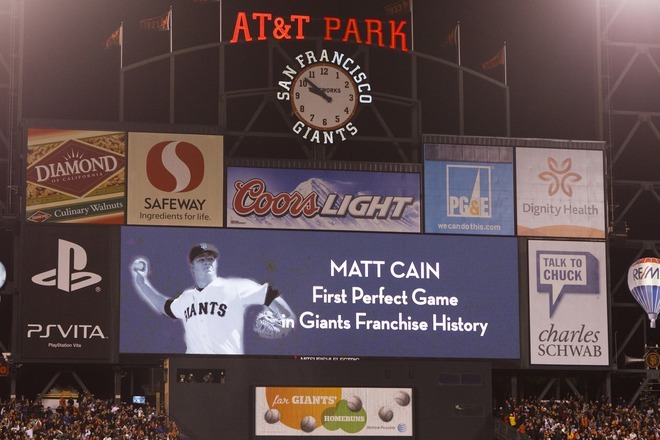 Tonight another Cain, Matt Cain now has a mark, but not like the biblical Cain, Matt Cain pitched the 22nd Perfect Game in MLB history and the first in the 130 years of the Giants Baseball Club. I have been a Giants fan since I was a kid. Back on August 24th 1975 my dad took my brother and me to Candlestick where we saw Ed Halicki no hit the New York Mets. In 1976 John “the Count of” Montefusco no-hit the Braves in Atlanta. It was almost 33 years before the Giants got another when on July 10th 2009 Jonathan Sanchez no-hit the Padres facing 28 batters, one more than a perfect game due to a fielding error. Hall of Fame pitchers for the Giants to pitch no-hitters have included Christy Matthewson, Carl Hubble, Gaylord Perry and Juan Marichal. 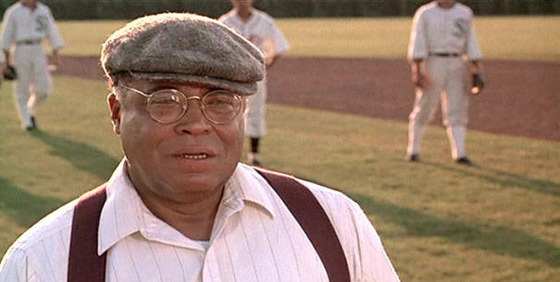 But no Giants pitcher had ever pitched a perfect game. The perfect game is one of the most miraculous and magical moments in all of sports simply because anything, a bad pitch or an error or a bad call can end the bid, who can forget the call by Umpire Jim Joyce that kept Armando Galarraga from a perfect game in 2010. The novel The Perfect Game which became the Kevin Costner film For the Love of the Game does such a wonderful job of portraying the miracle. 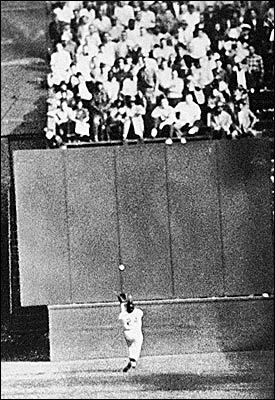 It seems that nights like this, the pressure, the miraculous and unbelievable catches made in the field and the ability of a pitcher to get out after out. Cain understands this, he has taken 5 no hitters into the 7th inning during his career and never got the no-hitter. Cain is one of the best pitchers in the game. 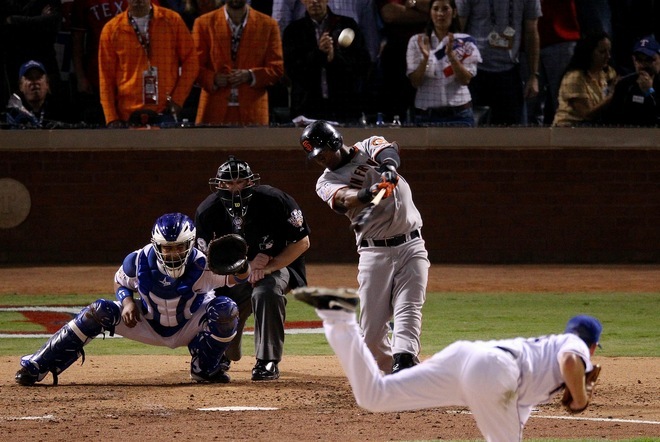 During the 2010 World Series Cain pitched 21 1/3 innings without giving up a run. This year he is 8-2 with a 7 game winning streak and a 2.18 ERA. The performance was one of the best ever even in a perfect game. Cain dominated with 14 strike outs tying the Major League mark set by Sandy Koufax in 1965. 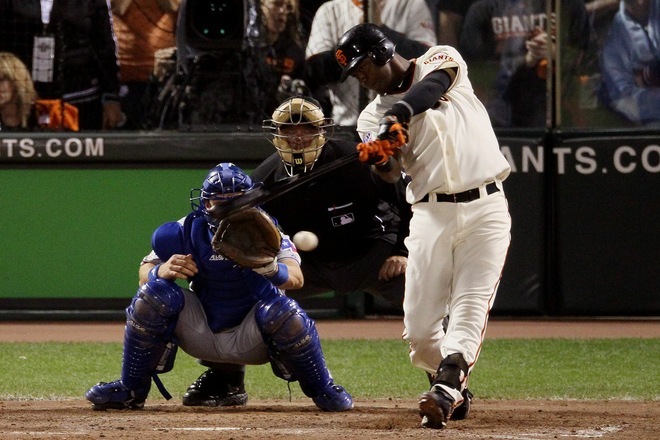 Cain helped his cause by getting a hit and scoring a run. The first pitcher since Dennis Martinez to get a hit in a Perfect game since Dennis Martinez in 1992. 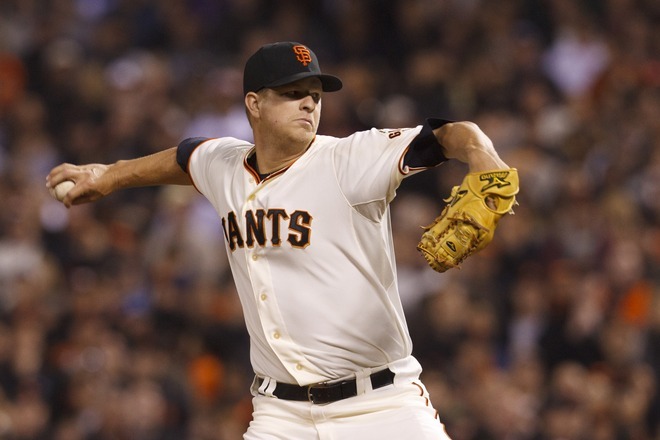 Cain threw 125 pitches, the most in a perfect game in MLB history. Several great defensive plays helped bring on the magic. Melky Cabrera made a leaping catch at the left field wall in the 6th inning and Gregor Blanco who came out of nowhere to make a diving catch going toward the wall on the warning track on a hit that looked as if it would be the first hit and go for extra bases. 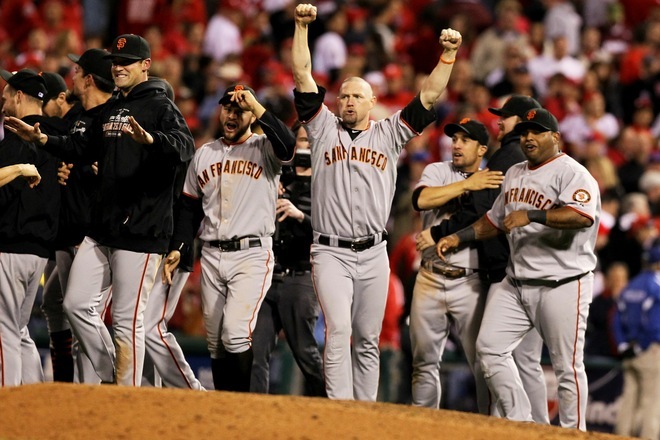 The Giants also set a record by scoring 10 runs in a Perfect Game. 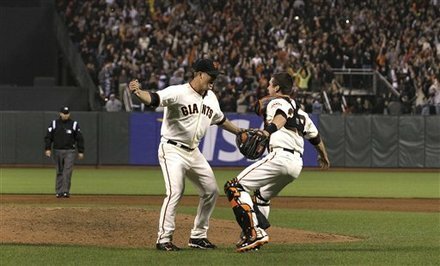 Matt Cain left his mark on Baseball tonight and hopefully he will continue to give those that love the game more of these memories. Now I need to try to calm down enough to get some sleep. 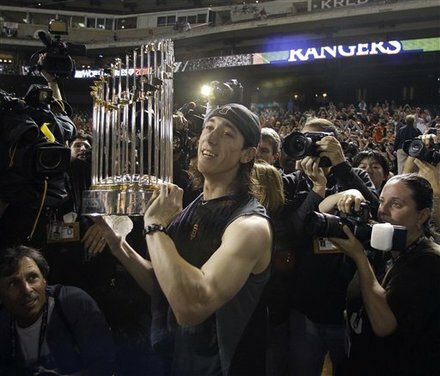 The World Series went to Texas and the Texas Rangers got out to an early lead off Giants starter Jonathan Sanchez and never lost it to give the Rangers the win and hope to come back in the Series. Sanchez was not sharp and struggled in 4.2 innings work but the major damage was done with two outs in the bottom of the 2nd inning when rookie First Baseman Mitch Moreland fought off pitch after pitch with two strikes and belted a home run into deep right center field to give the Rangers a 3-0 lead. 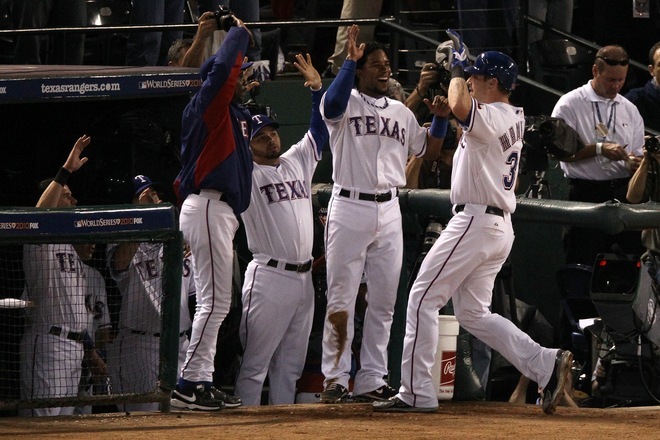 Sanchez gave up a solo shot to Josh Hamilton in the bottom of the 5th inning which drove him from the game. Giants’ relievers held the game close and the Giants threatened but could not come back. Rangers’ starter Colby Lewis pitched the Giants well going 7.2 innings allowing 2 runs on 5 hits. 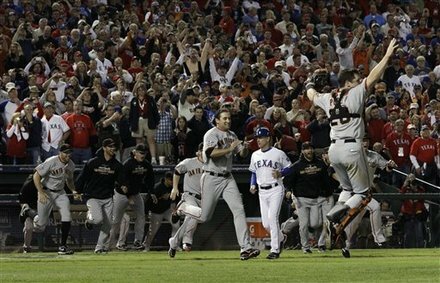 Both runs were the result of Giants home runs by Cody Ross and Andres Torres. The Rangers had 4 runs on 8 hits with no errors and the Giants 2 runs on 5 hits with an error. Colby Lewis got the win for Texas and Sanchez the loss. Neftali Feliz pitched a scoreless 9th inning to get the save as the Rangers drew within one game of the Giants. The teams meet tonight with Madson Bumgarner (7-6 3.00 ERA) on the hill for the Giants and Tommy Hunter (13-4 3.73 ERA) on the mound for the Rangers. The Philadelphia Phillies and their fans looked on in stunned disbelief as a team of no-names, cast offs and some remarkable starting pitchers and relievers defeated the Phillies in six games to advance to the World Series. 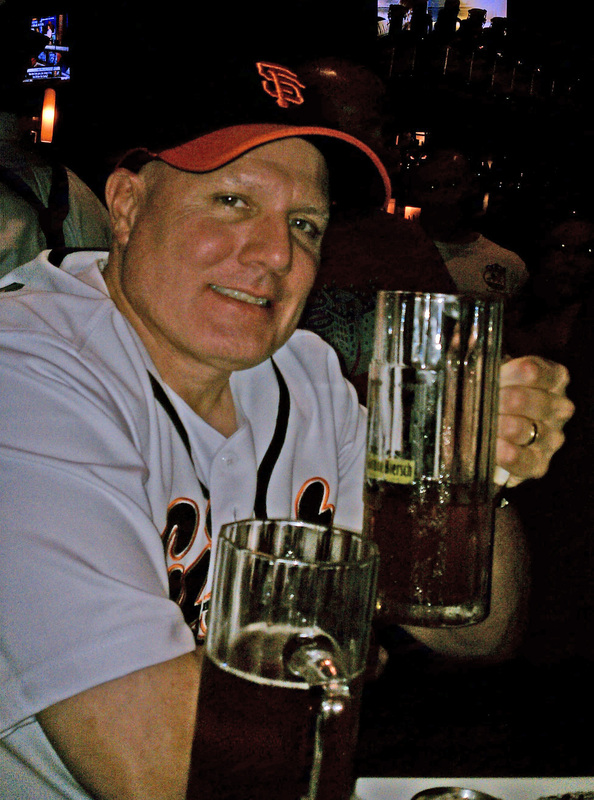 Once again it was a nail-biting tension filled decision that would have driven the Dalia Lama to drink and drink heavily if he is a Giants fan. It was a game that exemplified the Giants season, a comeback win in the late innings that came down to the Giants closer Brian Wilson against Phillies slugger Ryan Howard in a battle of power against power with two men on base and a full count and on that count he stuck the Phillies slugger out looking. The game started with the Phillies getting out to an early 2-0 lead in the 1st inning. Giants’ starter Jonathan Sanchez had trouble finding the plate and was hit early. Placido Polanco walked and took second on a wild pitch and scored on a Chase Utley double. Utley took third when Ryan Howard singled and scored on a sacrifice fly by Jayson Werth. It looked like the Phillies were on their way to forcing a game seven and judging by the noise of the partisan Philadelphia crowd it seemed that the Giants just might get smacked around hard. Sanchez was able to finish the inning and send the Phillies down in order in the second inning. Phillies starter Roy Oswalt seemed in control early but the Giants tied the game in the third inning when Jonathan Sanchez hit a leadoff single and took second on a single by Andres Torres. Freddy Sanchez then grounded out to advance the runners. 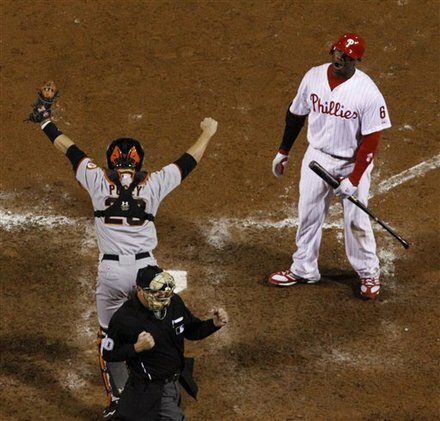 Aubrey Huff singled to score Sanchez and Torres scored when Ryan Howard botched a ground ball by Buster Posey. The bottom of the 3rd inning was interesting as Sanchez hit Chase Utley with a pitch to the back. Utley seemed to innocently pick up the ball and lob it back to the mound. A stare down and words between Utley and Sanchez resulted which escalated to words and then benches cleared as both teams took the field to be broken up by the umpire crew and cooler heads on both teams. 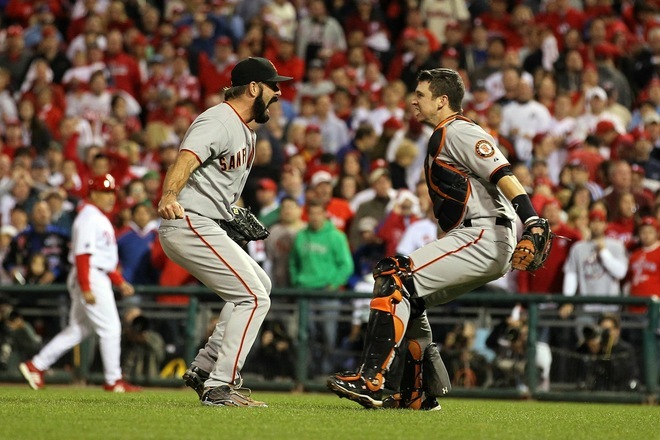 Bruce Bochy took the angry Sanchez out of the game and send in Jeremy Affeldt who sent the Phillies down in order. The game settled down as neither team could get their offense going although both teams had chances in the 4th and 5th innings. 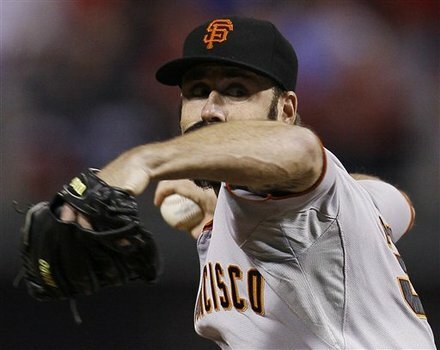 Affeldt retired the Phillies in order in the 4th inning and was relieved by Madison Bumgarner. 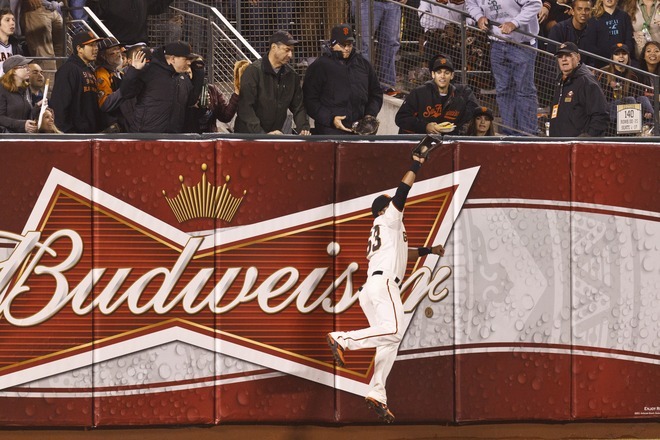 Bumgarner gave up a leadoff single to Jimmy Rollins and then retired Placido Polanco and Chase Utley on fly balls. Ryan Howard slammed a double to left center which sent Rollins to third. Bochy had Bumgarner intentionally walk Jayson Werth to get to Shane Victorino who grounded harmlessly to Bumgarner to end the inning. In the bottom of the 6th Bumgarner gave up a leadoff double to Raul Ibanez who went to 3rd base on a sacrifice bunt off the bat of Carlos Ruiz but was left stranded when Bumgarner struck out Ben Francisco and got Rollins to fly out to end the inning. Ryan Madson relieved Oswalt in the 7th and was able to keep the Giants off the board in that inning while Giants’ reliever Javier Lopez came in for the bottom frame and got Polanco to Fly out, Utley to ground out and sent Ryan Howard down swinging. The game went to the top of the 8th inning still knotted at two runs apiece and Madson came back out to pitch the top of the 8th. Madson has been a one inning reliever all year so this was a change for him. He retired Pat Burrell on a ground out and Cody Ross on a deep fly ball to left which brought Juan Uribe to the plate. Uribe had jammed his right hand sliding into first in game one of the NLCS and sat out game two and took a pitch off the same hand in game five. Uribe took Madson yard on a fly ball which kept going and tailing away in right field until it cleared the wall by a couple of feet. The Phillies and their fans went silent as Uribe rounded the bases and scored the go ahead run. 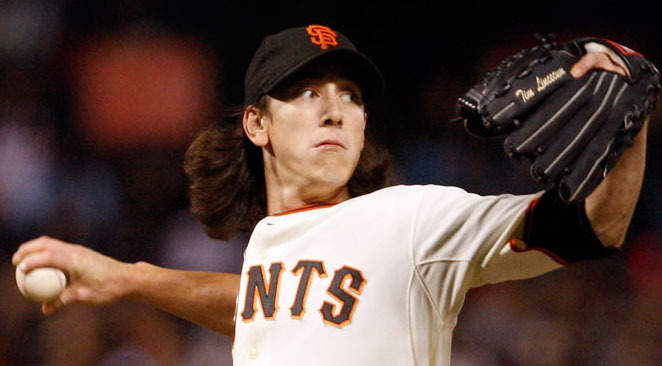 The Giants brought in starter Tim Lincecum into the game to pitch the bottom half of the 8th and he struck out Jayson Werth to begin the inning. He then gave up consecutive singles to Shane Victorino and Raul Ibanez and was lifted for closer Brian “Fear the Beard” Wilson. Wilson got Carlos Ruiz to line out to first baseman Aubrey Huff who threw to second to double up Victorino for the final out of the inning. The Phillies sent out closer Brad Lidge in the top of the 9th inning to keep the game close and he did that though things did get a bit sporty for the Phillies when the Giants had runners on second and third with 2 outs with Buster Posey at the plate and Wilson on deck. Charlie Manuel had Lidge intentionally walk Posey to load the bases and Wilson grounded out to first to end the inning causing the entire Phillies nation to breathe a collective sigh of relief. 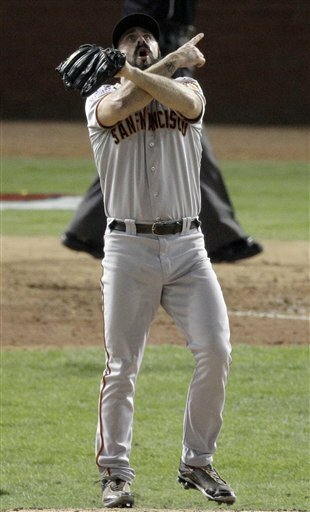 In the 9th inning Giants fans were treated to another inning of Giants’ baseball sometimes known as “torture ball.” Wilson got the leadoff batter, pinch hitter Ross Gload to ground out and then walked Jimmy Rollins. Rollins advanced to second on a ground ball fielder’s choice by Polanco and Wilson then walked Chase Utley to put runners on first and second to bring up slugger Ryan Howard who worked to count to a full count before going down looking on a called strike three to end the game. Silence engulfed the stadium as the Phillies and their fans sat or stood in stunned disbelief, a few boos were heard but the bulk of the noise in the stadium came from a group of cast offs, has beens and never weres who were dismissed for much of the season by almost every baseball expert, even the series MVP Cody Ross was sent home by the Florida Marlins before being picked up by the Giants in August. Picked by most to finish no better than 3rd in the NL West the Giants were 7 games back of the Padres at the beginning of August. They won the division on the last day of the season, defeated the Braves in the NLDS and were picked to lose the NLCS to the Phillies in 5 or 6 games by the same experts who gave them no chance at the beginning of the season. Even in the pre-game show the commentators were picking the Phillies to force a game seven which the Phillies of course would win, I think hoping against hope to justify themselves. I on the other hand picked the Giants to win by looking at the numbers, match ups and statistics as well as the psychological factor that the Giants had nothing to lose because all the experts were saying that they had no chance. I really think that the Phillies believed the experts. I said that it would come down to pitching and in this both teams were pretty evenly matched with the Giants having a slightly better team ERA of 3.06 to the Phillies staff 3.08. However the Phillies continued not to hit the ball well just as they did in the NLDS against Cincinnati, where only 7 of the 13 runs that they scored were earned runs. 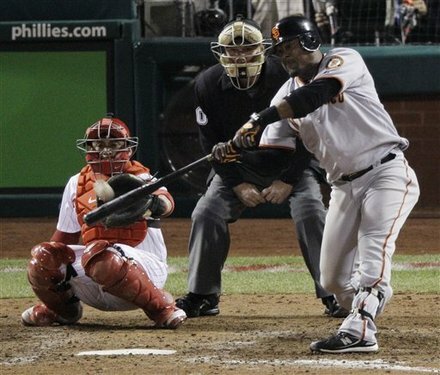 The Phillies mustered 20 runs of which 18 were earned s opposed to the Giants total of 19 runs of which 18 were earned. The Phillies hit a dismal .218 for the series collecting only 41 hits and the scrappy Giants hit .244 with 49 hits. The Giants had a better on base percentage and better slugging percentage than the Phillies in this series. This did not surprise me because of the Phillies dismal hitting in the NLDS and the fact that the Phillies and Giants had very similar numbers in all departments of offense except for stolen bases in the regular season. The experts had sold a myth that the Phillies were a massively better offensive team that would not let the Giants pitching staff get away with anything but the numbers told a different story a Phillies team that had a regular season batting average of .260 and 166 home runs and 1451 hits with a .745 OPS (on base+ slugging percentage) going up a Giants team that hit .257 with 162 home runs, 1411 hits and a .729 OPS. The Phillies did score more runs than the Giants during the regular season but one always has to weigh run-production with the other numbers. I think that many people simply saw that the Phillies had 75 more regular season runs than the Giants and assumed that they would pound the Giants pitching anytime a Giants’ pitcher made a mistake. They didn’t seem to look at the fact that the teams split their season series 3-3 and that the Phillies won two of those games in the Giants’ worst month of the season which was August. 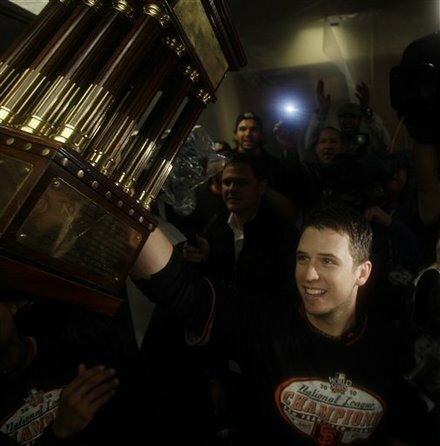 The Giants now go home to face the Rangers in Game One of the 2010 World Series. I am sure that once again that they will be dismissed. I will analyze the series as thoroughly as I did the NLCS and make my pick later in the week putting my obvious bias for the Giants aside in order to make an accurate pick. Until then my friends have a great Sunday and great week.